iPhone Life and Monster Are Teaming Up to Give You a Gold iPhone 5s! 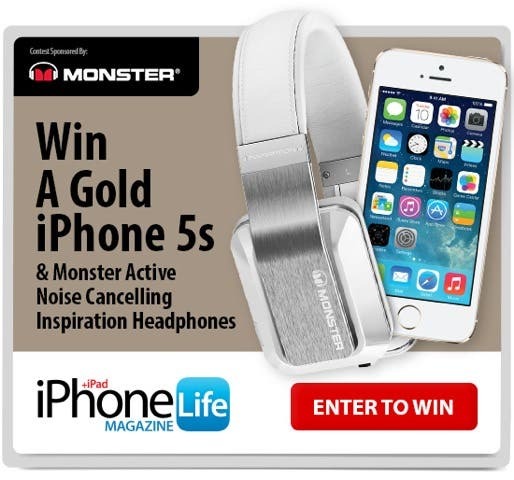 iPhone Life has partnered with Monster to give away an unlocked gold iPhone 5s and a pair of Monster Active Noise Cancelling Inspiration Headphones to our readers! That's a retail value of almost $1000! Here's how the giveaway works: enter your email at the GIVEAWAY PAGE. Earn one additional entry each time you share the giveaway with a friend via email, Facebook, or Twitter. Get 10 more entries every time someone you shared with signs up. There is no limit to the number of additional entries you can get by sharing the giveaway; so if you go all out, your chances of winning will shoot off the charts! And if a friend you referred wins the iPhone 5s and Monster Inspiration Headphones, you'll win a pair of Monster Inspiration Headphones too! So don't dilly dally, ENTER NOW and start sharing before the contest ends on December 20! Love fine print? Read the full giveaway rules HERE!